Tamayu is southeast of Tai Bwo Wannai by the mining area. Talk to him and ask to watch him kill the Shaikahan, and you will witness him losing. What Tamayu needs is a spear poisoned by none other than the poisonous octopus native to Karamja-the Karambwan. There is only one man who knows how to catch this fish and his name is Lubufu. This old coot is by the fishing area on the coast south of Brimhaven. Lubufu will tell you to go away so talk to him again and ask him "What do you do?" Ask him how old he is and after his lament about his old age and tired body, offer to collect bait for him to gain his trust. He will ask you to collect 20 Karambwanji. Go down to the lake south of Tai Bwo Wannai and use the small net to catch the Karambwanji (these can be taken to Lubufu in multiple trips). After running this errand for Lubufu, ask him what he uses to catch karambwan and what he does with them. He will offer to make you his apprentice and hand you a karambwan vessel. Drop it and talk to him again saying a karambwan got it. Repeat this until you have 3 vessels. Use the spare karambwanji on the vessels. You need to get a Karambwan to grind into a paste. The one the pub sells wont work due to the poison glands being removed. See: "Getting Tiadeche Back" below. Take the karambwan to the range in Brimhaven or light a fire to cook it. Once cooked, use it on the pestle and mortar to make a paste and apply it to your spear. Go back to Tamayu and use the poisoned spear and agility potion(s) on him. Ask him to go fight the Shaikahan again and he will win! You must venture to the northeast corner of the lower peninsula(Venture east from Tai Bwo Wannai and cross the river at the log then walk north). Go ahead and kill a Jogre on the way to grab his bones. Talk to Tiadeche and give him a vessel with the karambwanji in it. He will give you back a karambwan. Tiadeche will only go back to the village once he gets a crafting manual to manufacture the vessels. You will get this from Tinsay. Just hand him banana rum you made earlier! You need to properly prepare marinated burnt Jogre bones. This requires 2 Raw Karambwanji (the bait) and burnt Jogre bones. Now you have the properly prepared marinated Jogre bones. Use the bones on Tinsay and you are done with him. Use your filled vessel on him to get the crafting manual and take it back to Tiadeche. 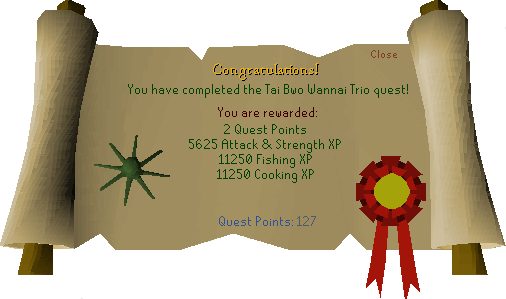 Return to Timfraku to complete the quest.